Happy New Year to everyone. Lets hope 2015 gives as many great opportunities and interesting images as last year! If you’d like your gorgeous pet photographed like this or any other style, please get in touch! Having shot some commercial images of animals for a pharmaceutical company I thought it would be interesting to photograph some portraits of a family pet. The thinking being that ‘snaps’ are fun to take in the garden or field but how would a more formal studio shoot go. I had learned a few ‘tricks’ from my previous experiences and the handlers I had worked with. The secrets are quite obvious but easily forgotten in the heat of battle. 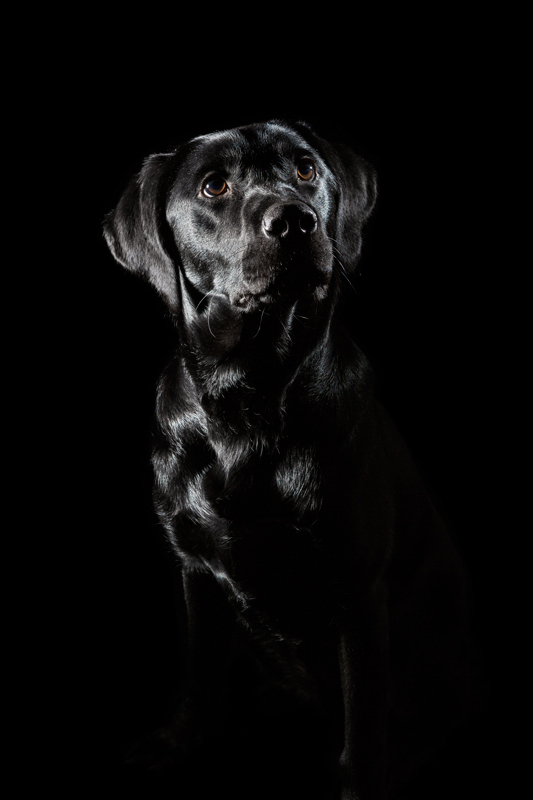 The idea behind the shots were to try to capture our Black Labrador “Smedley’s” personality but also his nobility and handsome good looks! He has a rich, deep, luxurious coat and that was something I wanted to highlight so a simple dark background, low key approach was what I decided on for these. It also gives the viewer a ‘feel’ for his wonderful character. Calm (for a puppy), strong and intelligent. Be very clear of the shots you want and the mood you are after BEFORE introducing your animal. Try to time your session with the animal to its most ‘chilled’ time of the day. After a walk, early evening etc. Keep the number of frames/time they’re actually ‘sitting’ to a very short timescale. You can repeat several times but keep each sitting short. Have an assistant (owner?) close to hand to help and be clear with them as to what you’re after, again before you bring the animal on set. 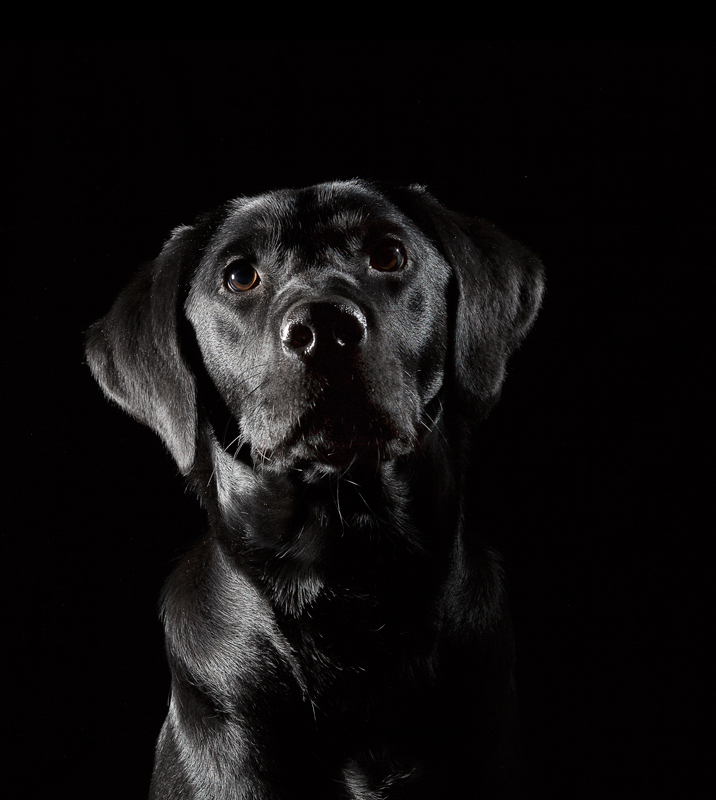 Flash the studio lights a few times before setting to work so the animal isn’t too spooked during the proper shoot. Have plenty of treats and favourite toys to hand to distract, cajole and encourage the animal. Be patient – if the animal won’t settle or becomes agitated you won’t get the shot anyway. Take a break, relax the animal and take your time. Be relaxed and encouraging to all parties at all times. Obviously different animals will require different strategies but this is a very rough guide and it helps to be mentally prepared before each session. Be clear on the type and style of shots you want prior to the session. 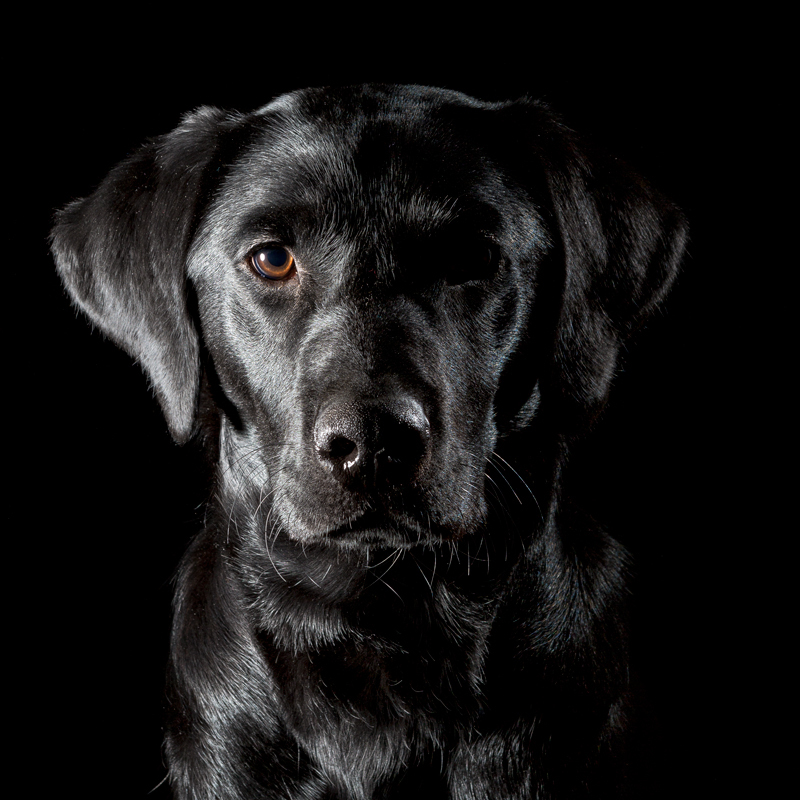 Talk with the owner/handler thoroughly as to their role and how you will conduct the shoot. As I say, it all seems pretty straightforward and simple but when you have an animal in your studio, things can quickly deteriorate and important clear thinking and easy details can be forgotten and lost. Have a great year and keep coming back for more updates!